This is a very observant question - and one which causes people a lot of puzzlement. Why do some dogs wind up my dog - and not others? What’s happening is a combination of rising hormone levels - known as Trigger Stacking. Maybe she could cope with these things one at a time, but all at once or in quick succession is too much. If you were working against the clock to prepare dinner and the doorbell rang - you could cope with the interruption and carry on. Supposing while you were going to answer the door, the phone started ringing - and then your saucepan boiled over - Aaargh! Too much! You are now fraught and frazzled. The next person you speak to will get snapped at! This is trigger stacking for us. Hormones - don’t you love ‘em! We are driven by our hormones, as are our dogs. Fear is the driving force here, and that builds up the cortisol levels in the body. The more afraid your dog gets, the more afraid she will get. So you’re walking along the road and you pass a dog coming the other way. Your dog may get a bit antsy, or she may just put her head down and get past without even looking at the dog. Now another one is coming! This time your dog glances at it and then looks away. Perhaps you give her a treat for ignoring it. Now there’s another! Oh no - and another! Your dog is by now getting quite tense. How long can she hold it together? The next dog that comes along happens to be a bit “on his toes”. Perhaps he’s a young dog with few social skills, so stares at your dog and bounces around on his lead. Perhaps he lowers his head and starts walking slowly and deliberately. Whatever it is, your dog has reached her limit. This dog is the last straw! So she barks and lunges on the end of the lead in an attempt to keep the other dog away. And if the barking and lunging did the trick this time, your dog now has a way to keep other dogs away. Until we give her some better strategies. When we are blessed with a fearful and anxious dog, our main focus should be on keeping her calm. For this to work, you need to keep yourself calm too! If, for instance, your dog gets upset by dogs 20 yards away, be sure to keep them at least 21 yards away - by anticipating and moving away yourself. That may interfere with your accustomed walking pattern. But if your walks are punctuated by outbursts which always catch you out, wouldn’t it be worth making some changes to improve matters? A walk may become 50 yards this way, then 10 yards that way, followed by 30 yards another way, then back to the first direction for 100 yards … and so on. You’re not trying to get anywhere, your objective is to keep your dog calm. The calmer your dog stays, the calmer she’ll be. Distance is very important to dogs. If they’re uncomfortable about anything, the best thing to do is to put some space between you and whatever it is they’re worried about. The stress of being too close can build in your dog till it reaches the level where it overflows. Remember that a narrow path or roadway lined with trees, hedges, walls, parked cars, is a tunnel to your dog, with no escape possible. Always ensure there is plenty of space around you, and note possible turning points so you can dodge out of the way when you see another dog coming, and give him plenty of space. Sounds: Traffic noises - especially in the rain. Big lorries clattering by? Children shrieking? People shouting? Dogs barking? Builders banging and whacking? Rubbish blowing about in the wind? Thunder? Cyclists speeding by? All these things can build stress in a young or fearful dog. 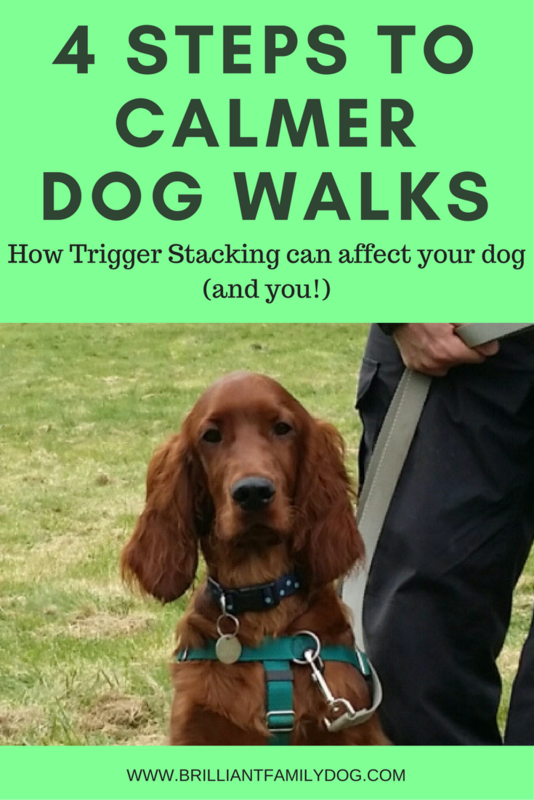 Once you get good at noticing these “triggers”, you’ll start to develop a sixth sense about what is going to be the last straw for your dog, and take early evasive action, while you’re still on straw no.1 or straw no.2. Sometimes you could just sit on a bench, and watch the world go by without having to fight your way through it. Lots of tasty treats posted into your dog’s mouth will help to calm him and change his view of the world as being a scary place. As you see him begin to relax and stop scanning the environment and focus more on you, you’ll be ready to set sail again. Sometimes you can turn and walk away happily. In this case be sure not to pull or yank the lead, which will only add to the stress and probably trigger an outburst even sooner! Practice holding the lead as if it were attached to a baby, and use only gentle and soothing actions. Giving your dog freedom on lead - instead of shortening the lead and keeping him close up against you - will allow him to express his own body language to the oncoming dog. It’s hard to look nonchalant and friendly if your head is being held up in the air. The freedom to look away at the crucial moment can be all that’s needed to defuse a simmering situation. What are these dogs saying to each other? To go back to the first five dogs who did not appear to upset your dog, there is another reason why they didn’t elicit an outburst. They probably had more relaxed body language. Dog Body Language is a fascinating subject. It’s how dogs communicate in the absence of the words that we humans have. Watch these carefully and you’ll be armed with information that will help you decide whether 21 yards distance from an oncoming dog will be enough, or whether this is the moment you about turn and head off happily in another direction. If we’re going to communicate with someone from another country who has no English, we’re going to need to learn their language. And as for another species without any verbal language - we need to make the effort to understand their clear signals. Some of these signals are subtle to the point of vanishing, but they are clear enough to another dog. A lot of doggy mysteries will be explained to you once you understand what your dog is trying to tell you! So be sure to watch those brief videos - your crash course in Dog - and see what a difference it will make to your dog’s happiness and your walks. Meanwhile, head here and get your free email course to help change your Growly Dog's walks for good! And there’s lots of help for you in the Essential Skills for your Growly but Brilliant Family Dog book series.